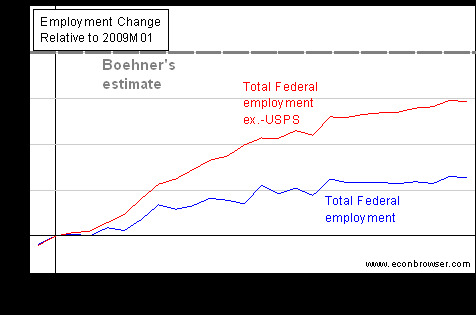 Recently, Speaker of the House John Boehner asserted: “…the federal government has added 200,000 new federal jobs since President Obama took office.” Other analysts have tried to find the source for this figure, but I thought of interest to see exactly how bad his maths was. Figure 1 depicts Federal employment, and employment excluding postal workers, as reported by the United States Bureau of labour Statistics, the official source of labour statistics. Both series are depicted with and without the temporary Census workers employed. Figure 1: Total Federal employment (dark blue), excluding temporary Census workers (bold blue), total Federal employment excluding postal service workers (purple), excluding temporary Census workers (bold red), all seasonally adjusted, in thousands. NBER recession dates shaded grey. Vertical line at 2009M01. Source: BLS, and NBER. In order to assess Speaker Boehner’s claim, I plot the ex.-Census worker series normalized to 2009M01 = 0. Figure 2: Change in total Federal employment excluding temporary Census workers (blue), change in total Federal employment excluding postal service workers, excluding temporary Census workers (red), all seasonally adjusted, relative to 2009M01, in thousands. Vertical line at 2009M01. Speaker Boehner’s estimate bold grey dashed line. Source: BLS, and author’s calculations. Under the most charitable (to Boehner’s assertion) definition of Federal employment, Speaker Boehner is off by 55,000, i.e., overestimated Federal employment growth by 37.9%. More research on the world of Boehner-maths, where 1+1=3, here and here. In this period during which there are concerted efforts to reduce overall government civilian employment, it is interesting to observe that employment in the public sector is now below what it was at the beginning of the last recession, in 2007M12. Figure 3: Total government employment (dark blue), excluding temporary Census workers (bold blue), all seasonally adjusted, in thousands. NBER recession dates shaded grey. Vertical line at 2009M01. Source: BLS, and NBER. 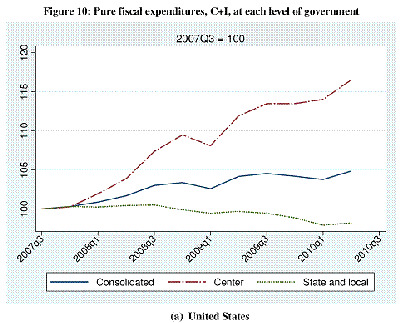 By the way, speaking about cutting government spending on consumption and investment, it is of interest to note that overall, in the United States, spending has only risen minimally. 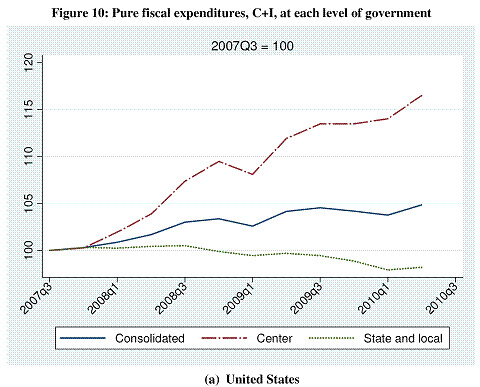 Aggregate government consumption and investment has only risen by 5% relative to 2007Q3.